Build an archway - a simple one - an archway for the inside of your home, to perhaps accent a hallway or entryway. You can create a simple non-structural arch shape using either of two methods. 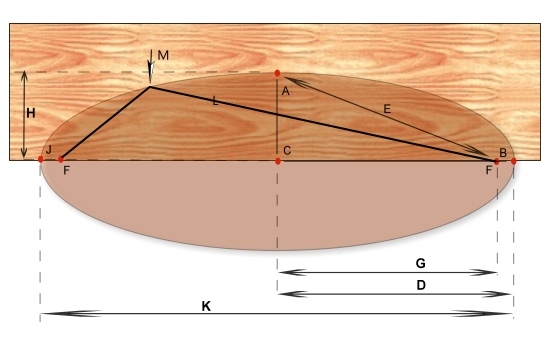 The first is to create an elliptical arch using the arch calculator. Locate points J, A, C, F, and B on your arch material. Drive a nail into points J and B (this is the total width of the arch). Tie a string connecting both points (make a loop on each end so that the string can easily be removed, but make sure that the string is tight). Remove the string from points J and B. Remove the nails from points J and B. Drive a nail into both focus points (F). Place the loops on each end of the string (represented as 'L' in the diagram) onto both focus points (F). Starting at point J, you can now draw the shape of an ellipse using a pencil (M) and the loose string (L) as a guide. The second method, is to make something that you can bend to the shape of an arch to use as a template. To do this, rip a 1/4 inch wide strip of wood off of a piece of 3/4 inch thick lumber, the same length or longer than the horizontal span of the arch you are creating. Pick out a piece of scrap board that you probably won't use for any other purpose to create the template. The goal is to create an arch template that is thin enough to bend without breaking, as well as, thick enough to bend without breaking. The 1/4 inch material has just enough bend in it to make a nice smooth arch shape (you may need to make it a little thinner or a little thicker, depending on the flexibility of the species of wood you are using). Place it on the board (particle board is what is shown in the diagrams), bend it to the desired shape, and mark the outline with a pencil and use a jigsaw to cut it. Once the first arch is created, use it for a template to create the other parallel part of the arch (see figure [A]). 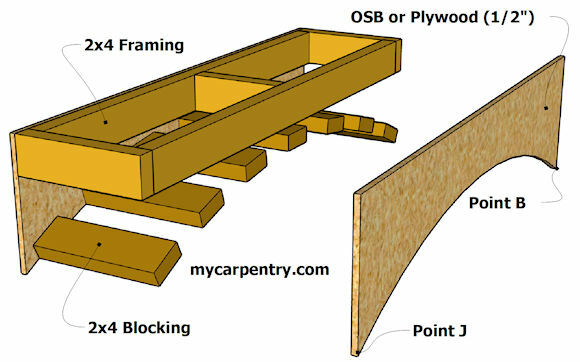 You can use 2x4 framing to attach the two pieces together as shown in the diagram below. 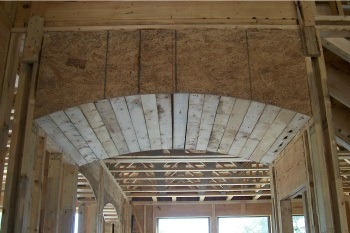 These 2x4s provide structure for the arch and serve as nailers for finish material. 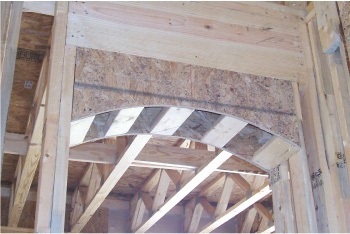 This method of building an arch could be applied to any small (non-structural) decorative arch. Return to How to Build. Leave Build an Archway and return home.